What is Wounded Warrior Project? Wounded Warrior Project (WWP) is a nonprofit, nonpartisan organization headquartered in Jacksonville, FL with additional program offices located in New York City, San Antonio, Chicago, San Diego, and Washington D.C. The WWP vision is to foster the most successful, well-adjusted generation of wounded warriors in this nation’s history. 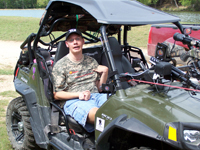 Eric Edmundson, a warrior wounded in a 2005 incident, is able to hunt with an adapted ATV equipped with a five-point harness, special weapon mount and siting screen. Hunting has been Eric’s lifelong passion – and with your help, WWP is now assisting him in fulfilling his “grand slam” hunting list of large game animals. He will be accompanied on this excursion by his parents and caregivers, Ed and Beth Edmundson. To read more about Eric, please visit http://www.ric.org/about/ric-patient-stories/traumatic-brain-injury-eric-edmundson-story - More internet articles about Eric Edmundson are available through a basic internet Google search. Session One of Eric’s outreach and hunting excursion will begin in early August and end in mid-September 2011. This Trip will begin in Jacksonville, Florida, at the WWP Headquarters where they will pick up the camper and receive an official send-off, leaving for the first location: Hunt (1) which will be for Alligator and wild boar in Florida; then on to hunt (2) will be for Axis Buck in Texas; hunt (3) will be in Missouri at High Adventure Ranch for American Trophy Bison; hunt (4) will be an archery hunt in Colorado for Elk; and finally hunt (5) in Iowa for a Corsica ram harvest. After stopping for a brief rest and break, the Edmundson’s will resume the excursion for Session Two which will begin in early October and end in mid-November : hunt (6) will be in Montana for pronghorn antelope, Hunt (7) will be in Idaho for bear; and finally hunt (8) will be in Wyoming for a white tail deer harvest, which will conclude session two of this trip in mid-November 2011. Along the excursion route the Edmundson’s will be stopping at four designated Outreach locations to speak and provide educational information to communities about Wounded Warrior Project and its many programs and outreach campaigns. Among others, this will include the Warrior Independence program and the Believe in heroes™ campaign which is intended to bring awareness and “Put The Veterans Back In Veterans Day” which will take place this fall – to include multiple signature events launching across the USA between 9/11/11 and 11/11/11. High Adventure Ranch is very proud to be a part of this campaign.